FORT GEORGE — The city has seen the light on making some long-overdue improvements to the decrepit tunnel leading to the 191st Street 1 train station. 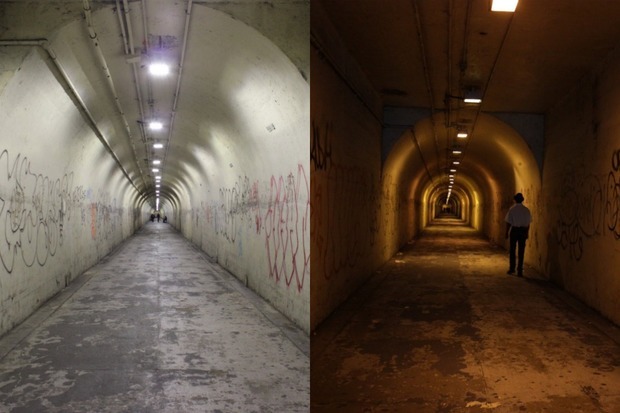 The Department of Transportation recently replaced all the overhead lights in the three-block tunnel with much brighter LED fixtures, Margaret Forgione, DOT’s Manhattan borough commissioner, told residents at a Tuesday community meeting. The agency will also clean and repaint the tunnel in early November and plans to eventually have the artwork at the tunnel's entrance redone. Residents have complained for years about conditions in the 191st Street tunnel, including poor lighting, graffiti and cyclists who ride through the space illegally. After Councilmember Ydanis Rodriguez held a walk-through of the space in August, the DOT committed to making improvements. A recent visit revealed that while the tunnel is still covered in graffiti, it was noticeably cleaner and better lit. Residents said they were happy to see the changes. “The light now is very good,” said Naranjo, a 27-year resident of the neighborhood who uses the tunnel every day. Naranjo said she hopes the city has a plan to maintain the improvements. “They are fixing and remodeling the tunnel now, but we need more controls to make sure people don’t graffiti, don’t put trash on the floor,” she added. Moises Fontana, 52, who has been playing guitar in the tunnel several times a week since February, said the experience is more pleasant now that the space has improved. However, he also sees the need for more enforcement and security measures, such as an emergency phone or intercom.